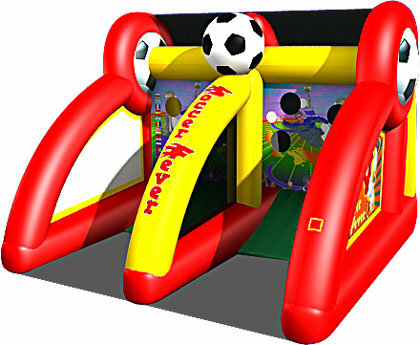 The Soccer Fever inflatable game puts players in the competitive mode. Participants take their shot at the back wall to score points through the different openings. The soccer ball then returns to the opposing players lane, and the two kickers then try to get rid of all the balls in their lane first. The fast-paced inflatable game offers soccer field artwork in the background, with images of the flags of soccer-loving countries from around the world. Great fun for sporting events, field day, school, church or corporate events.